Why take up your time with bandwidth hogging, virus-laden bloggery? I'll tell you. Every so often I get to rave about something I have ABSOLUTELY ADORED. And you get to come along for the tedious, never-ending jungle cruise ride! 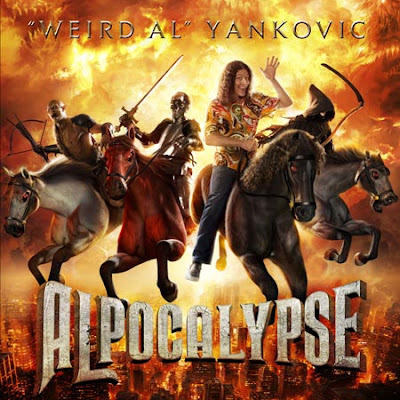 'Weird' Al Yankovic is a pastiche maestro, foremost satirist in the land, indeed, a PARODY LORD if such a title exists. And it does, now. To my great regret, I haven't bought a brand new CD for years, but spare no expense and get yourself the deluxe edition of 'Alpocalypse' with the 10 music video DVD included. LIKE ME! Or download it from itunes. Or, yes, borrow it from me and nod along politely. You get 'Polka Face', which despite what you've heard is not a horrible disease! Make sweet love to a manatee with Charles Nelson Reilly. Torment others with 'Ringtone', maybe even use it against regimes you disapprove at a 'Party in the CIA'! You even get to writhe along to the almost-didn't-get-to-be-released 'Perform This Way' which was apparently saved by an outstanding Twitter response. Yay, tweeps! I was already a huge fan of the previously digitally released 'Whatever You Like' for it's wise-acre approach to low-budget romance, and now I can't stop listening to 'If That Isn't Love'. 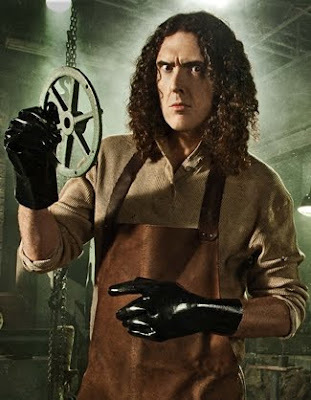 Mrs. 'Weird Al' is a SAINT, I tell you! As usual, my favourite album is whatever one Al is currently promoting. I give you my word- it's so beautiful it makes a glorious sunset look like a big, fat turd.